There are many reasons to hike the Appalachian Trail, and many ways to do your hiking. Most folks are out to enjoy a section hike, a few hours or days of exploring a favorite stretch of trail. Some choose to hike the entire trail in one calendar year; this is called a “thru-hike.” A thru-hike normally takes from 4-7 months and winds along the 2,168 miles and 14 states the trail passes through. During a fall and winter of travel, writing and planning, I decided that I’d attempt a thru-hike of the Appalachian Trail. A thru-hike would offer me several things I was looking for; a grand adventure, a physical challenge, travel in new places, a summer in the outdoors, and a chance to meet new people. After a great deal of research and preparation, I selected my equipment. I’m a lightweight backpacker at heart, and going lightweight seemed to make even more sense on such an epic hike, where staying fit physically and mentally was so important. Through www.trailplace.com I contacted a “trail angel” in Atlanta who offered to bring me to the trailhead on March 31. Chuck proved to be fine fellow and housed my first trail friends, Stan and Tina, the night before we headed out to the trail. Around noon the next day, we stood atop Springer Mountain, then turned and headed towards Maine. It was hard not to feel like a fraud when boyscouts would stand in awe after finding out we were walking all the way to Maine. I thought it was interesting that people seemed just as impressed when I was PLANNING to hike the whole way as when I had completed to trail. Is a Thru-hike for You?Before you tell off your boss, sell your home, and kiss your girlfriend and old life goodbye, you should know as much as you can about the trail, and yourself and motivations. There’s a saying I like along the lines of “A lot of people want to be authors, but not many people want to write.” Ultimately, on the AT there’s a lot more people who want to be thru-hikers than there are folks who want to actually wake up each morning and head for Maine (or Georgia.) When people talk or write about the trail, they like to talk of the splendid sunsets, the beauty of the wilderness, the friendships and spectacular views. You hear less of the aching knees, the fatigue, the insects, putting on cold, wet shoes and clothes morning after morning, and the sometimes suffocating humidity of the Appalachians in summer. You hurt a lot, you’re tired a lot and to be frank you spend a whole lot of time simply enduring. If you think I’m overstating the negatives, consider that 25% or less of the people who commit to a thru-hike, actually finish. I think it’s fair to say that most people who don’t finish have the ability to finish the trail if they truly had to, but they find it isn’t worth the cost in physical or mental discomfort. Vast numbers of hikers find they get too homesick, discouraged or disillusioned. Many have the mental drive but suffer injuries that preclude their finishing. Somewhere in the neighborhood of 25% drop out by Neal’s Gap, only 30 miles from the start of the trail. There’s nothing shameful about not finishing the trail, of course, but it’s wise to look at the endeavor realistically before you begin. Remember, it’s not primarily a CAMPING trip, it’s primarily a HIKING trip. Good judgment: knowing when to push and when to rest, etc. It was a lot STEEPER that I thought it would be. According to Wingfoot, there are about 91 vertical MILES of climbing and descents on the AT. I’m sure it’s that much, at least! 91 vertical miles of climbing is 480,480 vertical feet. If you finish your hike in 5 months, or lets call it 150 days, that’s 3,203 feet of climbing and descent EVERY day. The trail was so steep and slippery in some places in New England that it was hard for me to believe that it was the AT. Of course, there were hundreds of miles of mellow trail too, and it doesn’t take a mountain climber to do the AT. Woodticks were a bigger factor than I expected. I grew up around woodticks without suffering any ill consequences, but during the summer of 2001 I TWICE had to take antibiotics to fight woodtick infections. I talked to several folks who had contracted Lyme disease, that summer or before. It was easier to get food and supplies than I thought. Seldom did I have to carry more than four days worth of food. There were a lot fewer single ladies on the AT than I expected. This was a favorite topic of my buddy Metro! People were so friendly. I had no problems with locals. Usually it was easy to hitch to and from town, and many times trail angels left cold drinks and food at trail crossings. Virginia is not flat, contrary to what you might hear. I rarely slept in shelters. For me, shelters tended to be mousy, buggy, loud and had hard floors. I think what appeals to people most is the social aspect of the shelter, and the avoidance of putting up and taking down their tents/tarps, especially when it’s rainy. With the right folks, shelters were great, but I usually prefered tarping out, often in the company of friends. Mail Drops and Food DropsLike so many topics on the trail, this one is very subjective. Some folks do 30 or more mail/food drops, and some do NONE! I did food/mail drops at the following places, Fontana Dam; Waynesboro, VA, Harper’s Ferry, WV; Port Clinton, PA; Bear Mountain, New York; and Caratunk, Maine. To me, the trail is largely about freedom. Mail drops tend to make you speed up or slow down so you arrive at the right place at the right time. Before you start your hike, you don’t know which foods you’ll get tired of. Also, MOST folks who buy a summer’s worth of backpacking food end up not completing their hike. Often a food drop is missed, and there’s lots of hassles for everyone involved to get the package to where you’ll be next. There’s a certain burden placed on your support crew back home. Mailing food has grown more expensive. Saving on your grocery bill is usually not a sufficient reason to do a food drop. Usually you have food left when you get your food drop, forcing you to give away, throw out, or carry the extra. If I were going to hike the AT again, I wouldn’t plan ANY food drops. A thru-hike requires flexibility. Here’s a list of common food drop towns. Spend several weeks getting in good shape before the hike. Ease your way into it by starting out with a very light load on flat ground, and increasing the length, steepness, and weight as you progress. Don’t push too hard during the first days of your hike. Above all, don’t hurt yourself! I saw people get crippling blisters right off the bat. PREVENT blisters. Wear shoes that fit and stop and treat hotspots before blisters develop. Take a couple hours before you even buy your footwear and read through the articles on Fixing Your Feet especially the pages on blister prevention and footwear fit. As you get in shape, increase your mileage. Get in the habit of setting goals for the day. There are lots of things that may slow you down, including weather, illness, injuries, emergencies at home, etc., so don’t “get behind the curve” or you may find it impossible to catch up before those early October snows end your trip short of Katahdin. No Rain, No Pain, No Maine. If you never hike thru the rain and the pain, you’re not going to see Maine. That said, hike through discomfort, but don’t continue to push when you’re doing damage to your body! Remember to take the time to look around you. See and appreciate the forest, scenery, wildlife and people you meet. Be hiking at first light to see the most animals. Don’t be afraid of bears. As long as you don’t sleep with your head on a pizza or something, bears pose little threat. Bears instinctively realize that humans are boss. If you use bear bells, the bears won’t kill you but other hikers will. Don’t carry bear spray unless you need it to sleep. If you’re “bearanoid” sleep in shelters until you get over it. Hike your own hike. Don’t be concerned if others aren’t hiking up to your standards. Being a thru-hiker doesn’t make you better than other people or the center of the universe. Take zero days when you need them. Travel light. Don’t carry what you don’t really need. A lighter load will help you avoid injury, and make your hike easier and faster. Treat or filter your water, wash your hands before eating, and don’t share food with dirty hands. The best peer-reviewed scientific study on the Appalachian Trail concluded: Diarrhea is the most common illness limiting long-distance hikers. Hikers should purify water routinely, avoiding using untreated surface water. The risk of gastrointestinal illness can also be reduced by maintaining personal hygiene practices and cleaning cookware. Click here for a list of my gear and equipment and clothing recommendations. Mileages and DatesI began my hike on March 31, 2001. The weather was often rainy and foggy early on, and there was even a bit of snow for a few days. My gear kept keep me comfortable. I started out my hike in pretty good shape, quite a bit better than most folks starting the trail. On the second day I did 20 miles without much trouble. Towards the end of the trail, the folks I was hiking around had gotten much stronger, while I was in only slightly better shape. My pace, therefore, was fairly consistent throughout the hike. The first week I averaged 16 1/4 miles a day. Overall, I averaged about 17.6 miles a day, including 5 “zero days.” In central Virginia, I was averaging about 20 miles a day. My longest day was 30 miles. One of my few regrets is I never really pushed to see how many miles I could do at max. I heard of a 40, even a 50 mile day! For two weeks in the toughest parts of New Hampshire and Maine, I averaged only about 13 1/2 miles a day, which included a couple of short days. Most folks probably start out fairly slow, speed up dramatically in Virginia as they get in better shape and the terrain mellows, and then, like me, slow down when they get to that famous, beautiful, rough ground in NH and ME. Map Man has put together a very interesting page showing AT hiking rates for each section of trail. Well worth taking a look at to see what kind of miles people are hiking in the real world. SummitPost has a Appalachian Trail Mileage Chart which can be very useful for planning, especially for distances between given points. It lists shelters, major landmarks etc. 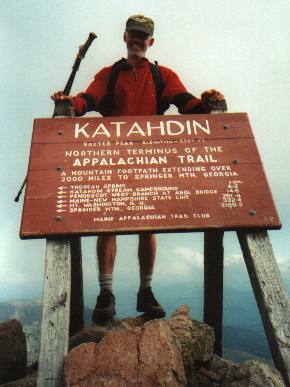 I finished my hike on August 3, 2001. On the mountain with me that day were Windex, Del, Mukwa, Andalia, and several other friends from the trail. Whether you are a section hiker or thru-hiker, I wish you the best of luck. Questions or comments are welcomed below. thinking of hiking this summer april..anybody else..not planning on rushing at all..really want to enjoy myself..maybe take a day or two in one spot and just enjoy….let me know maybe we can hike together since i dnt have anyone to hike this with..
Tim, have you seen the Whiteblaze forum? You might ask about a hiking partner there as well. My Name is James I am planning on starting mid april haven’t locked in a date yet, I am also going it alone and would meet up with you to start the journey together.